Long-stemmed red roses are a favorite Valentine’s Day gift among sweethearts. But did you know that Pennsylvania has many native roses growing wild? You may not see them at the florist, but they are important in the ecosystem and can add beauty and interest to a landscape. Five of the 13 species of roses growing wild in Pennsylvania are native. There is a distinction between “native” and “wild.” Many species of wild roses have escaped cultivations and were not known to Pennsylvania prior to European colonization. Most non-native roses come from Asia, Europe, or Eurasia. All roses are deciduous shrubs with at least some thorns and compound, toothed leaves. Contrary to the classic rose image, native roses have only five petals, not the “double-blooms” like popular landscaping varieties, such as the hybrid tea. One species of wild non-native rose does have double flowers, called memorial rose (Rosa wichuraiana), but is native to Asia and escaped cultivation and has become naturalized. What Do Native Roses Look Like? Native roses bloom in shades of pink, white, or magenta, but not red. Every rose may have its thorn, but the number varies from many large thorns, to only a few weak ones near the leaves, to fine prickles all over the stems. Native roses are important to pollinators, as well as birds and other animals (including humans) who eat the fruits, called “hips”, which are extremely high in vitamin C. Rose bushes provide excellent habitat for nesting and shelter for birds and small mammals. Meadow rose, also called smooth rose (Rosa blanda), is a native rose with arching stems that grow to about three to four feet tall, as well as coarsely toothed leaves and pink flowers in June. Meadow rose has almost no thorns, except a few bristles on the lower part of the plant. This species is found on rocky shores and slopes and is not very common in Pennsylvania. However, meadow rose can be found on Penn State property that’s open to public access called Stone Valley Recreation Area and also at Hartley Wood. It also can be found throughout Tuscarora State Forest. Pasture rose (R. carolina) is a native rose that grows across the state on dry banks, shale barrens, and other open grounds and thickets. It looks similar to meadow rose, only about three feet tall, except its stems are covered by prickles along the entire length. This rose produces small pink flowers May through June. Prairie rose, also called climbing rose (R. setigera), may produce single flowers or clusters of pink or whitish flowers June through July, and can have a climbing or trailing habit. This species is found in a similar habitat to pasture rose but is less common on sandy, dry, open areas like roadsides and fencerows. This species is native farther west, and it is considered escaped in New England. Swamp rose (R. plaustris) is a rare occurrence in marshes and swamps across Pennsylvania. As its name implies, swamp rose only grows in wet soil. It can be two to eight feet tall and often forms colonies or clusters. There are a few strong, hooked prickles near the base of the leaves and large pink flowers that you can see May through June. You can find swamp rose in swampy parts of Wildwood Park in Harrisburg, Swatara State Park in Pine Grove, and many wetlands in Northampton County including Minsi Lake. Wild rose (R. virginiana) is commonly found in pastures, roadsides, and other open places or thickets on moist soils. It can grow up to around six feet tall and has larger, pink flowers two to three inches wide that are not found in clusters. This species flowers May through early July, and can be found in areas such as Sinnemahoning State Park and Tioga State Forest. Interestingly, the pasture rose can cross-breed with prairie rose. 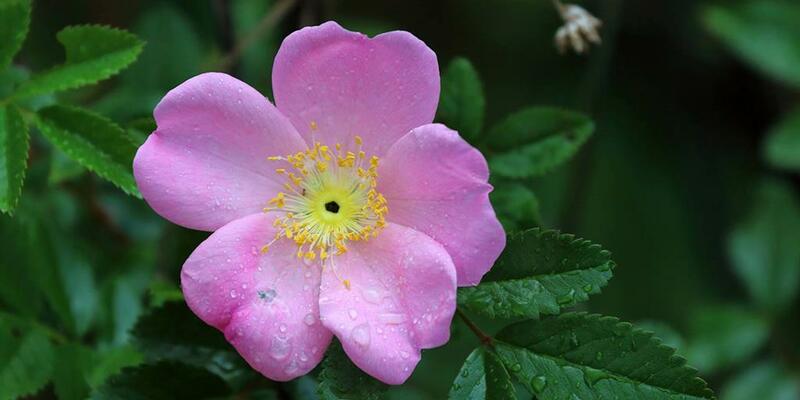 Probably the most well-known “wild” rose is multiflora rose (R. multiflora), an invasive plant which can create dense barriers along a woods edge or hedgerow. Most of the long-stemmed roses purchased in the U.S. come from South America, particularly Ecuador, where roses can grow to achieve long, straight stems by reaching toward the sun directly over the equator. To ensure your Valentine’s Day roses are grown in an environmentally and culturally friendly manner, you can look for logos or certification of sustainably-grown and/or fair trade plants. Or better yet, choose a potted, native rose, and plant it outside in the spring or fall. The fall is the best time to plant shrubs. To learn more about the importance of native plants and to access Pennsylvania landscaping resources and tips and much more, visit the DCNR website and iConserve PA website.